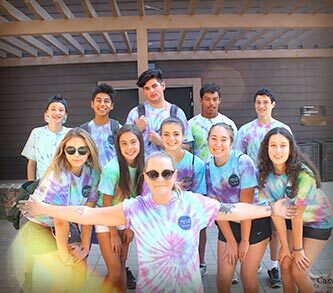 Mountain Camp Woodside offers a Counselor in Training (CIT) program available for both Day and Overnight campers entering 9-12th grade. The program emphasizes leadership skills, creativity, team building and most importantly fun! By acting as role models for younger campers and assisting in leading aspects of the camp program, it is our goal that our CIT’s walk away having learned new leadership skills, having formed lasting memories with our youngest campers. The CIT’s take part in a special training program, similar to our own counselors training, to help them better understand the importance of a counselor’s responsibilities. They will learn what it takes to be a good role-model, dealing with difficult situations – such as homesick campers, team-building, body language and speech, and safety. Alongside the training aspect of the program, CIT’s will improve their leadership and creativity, being tasked with the planning and executing of their very own activity to teach at camp. Resident CIT’s will also have the opportunity to lead an evening program for Alpiner campers. But, it’s not all work! Our CIT’s will enjoy unique activities and trips just for them, that other campers do not get. Trips to the park to compete in the annual CIT Hunger Games, beautiful hikes in the Portola Valley mountains and ice-cream breaks are all examples of special treats our CIT’s get to experience. They also get some down-time to be a kid! Taking part in Alpiner activities of their choice and the very popular Color Wars. One highlight for our resident CIT’s is the weekly slumber party! Complete with ice-cream parlour, zumba, glow in the dark mini golf, a chance to reflect on their week, and a movie, it’s one of the favorite parts of the week! CIT’s will be given their own branded, and pretty cool, shirts to wear so other campers and staff members can identify them as CIT’s. There is a short application that must be completed by the applicant in order to be considered for this program. After you have enrolled your camper for the CIT program, you will receive an email directing you to the CIT application within your Mountain Camp Woodside account. When choosing CIT candidates, past performance, the application and counselor references will be taken into account. To register your camper for our CIT program, please use our Enroll Online link at the top of the page. Once you put in your camper’s information, our system will automatically recognize their eligibiity for our CIT program and present that as a program option for the camp session of your choice. 9th grade is a tricky age and we looked around for a program where my son could learn about leadership, have some responsibilities of a counselor but not too many, and have some special and fun experiences just with kids his own age. At Mountain Camp Woodside he got to do all of those things! Even though it was his first time at camp at age 14, he felt very welcome and had a great time. - Jennifer S.